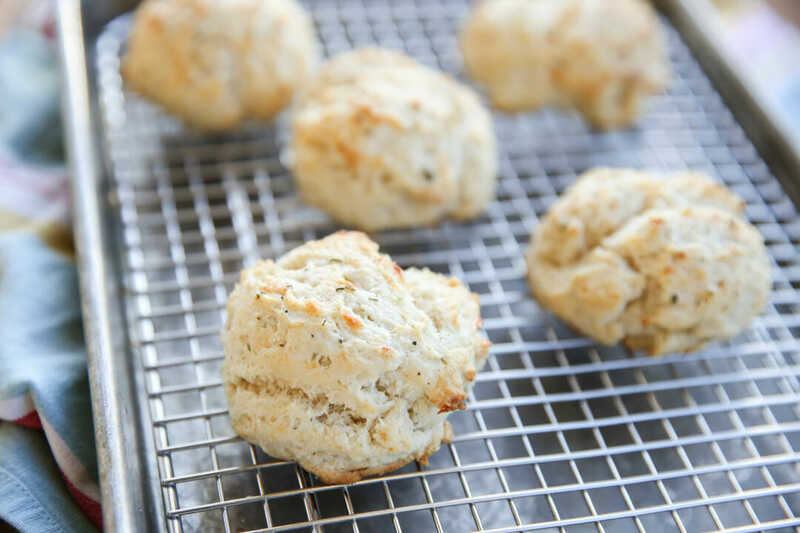 What I really wanted to title this post is 2-ingredient-easiest-you’ll-ever-make-super-soft-and-fluffy-amazing-biscuits, but it seemed…wordy. 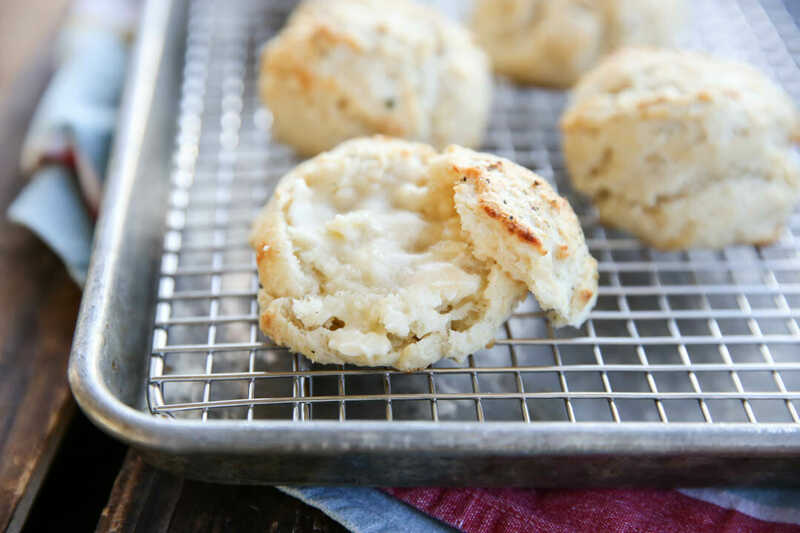 We love a good biscuit around here and we have some amazing recipes. 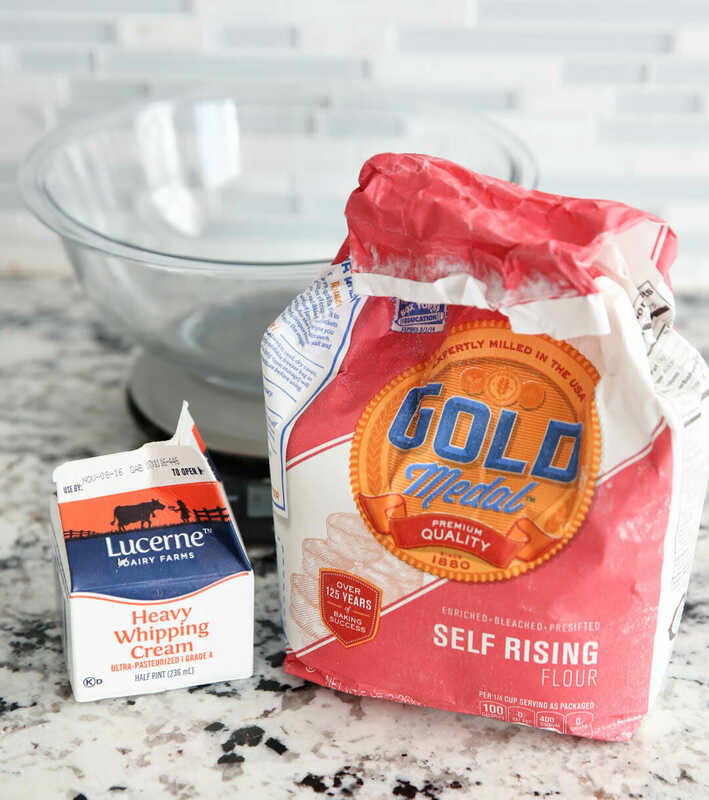 We’ve got these Classic Southern Buttermilk Biscuits, these giant, pillowy-soft Cathead Biscuits (weird name, great biscuit), these easy Buttermilk Cheddar Biscuits, and these quick Cheddar Cornmeal Biscuits. I like having options because all of those have different textures and are great for different types of things. You can also pick one depending on what pantry ingredients you happen to have on hand. I’ve made these before; the recipe just kind of “exists” out there, but was recently reminded of them when I spotted them on the KAF Instagram page. I whipped them up that night and remembered how good they were! So what are those magical two ingredients? 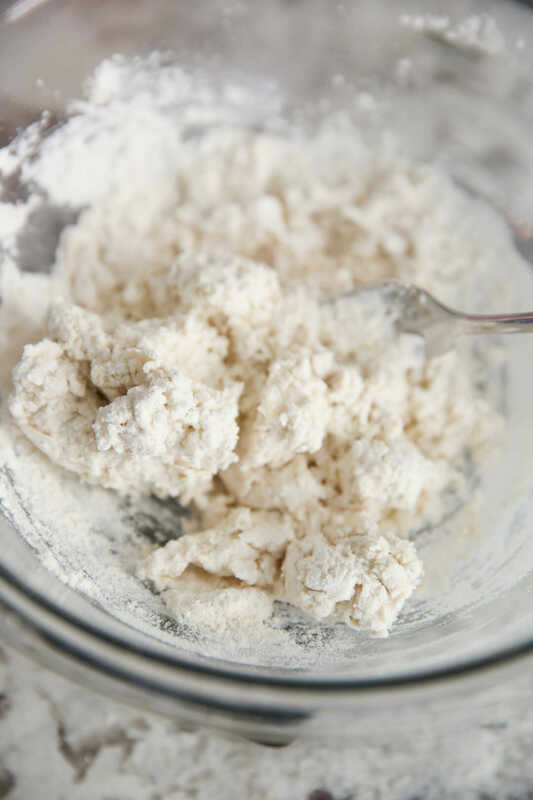 Self-rising flour and heavy cream. I keep a bag of self-rising flour in my freezer just for a few specific recipes, this being one of them. Then whenever I have a little extra cream on hand, it’s so easy to whip these up. 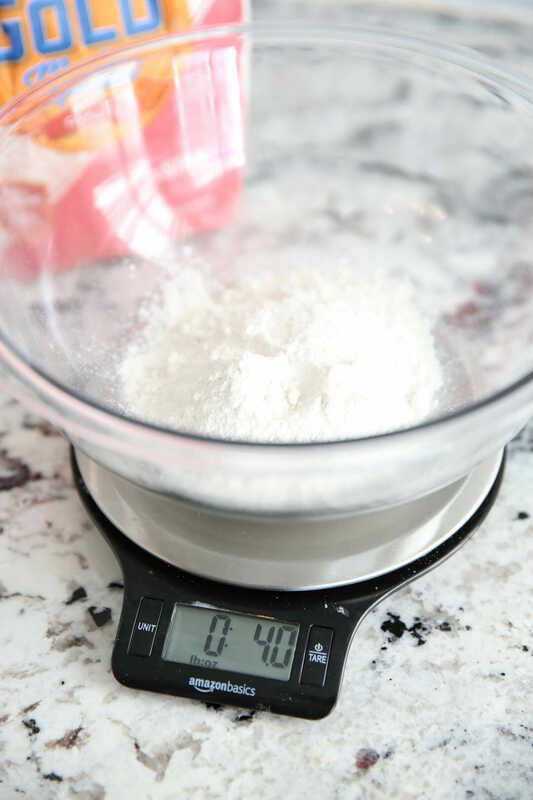 You don’t even need a recipe because you’re using equal amounts (by weight) of both. 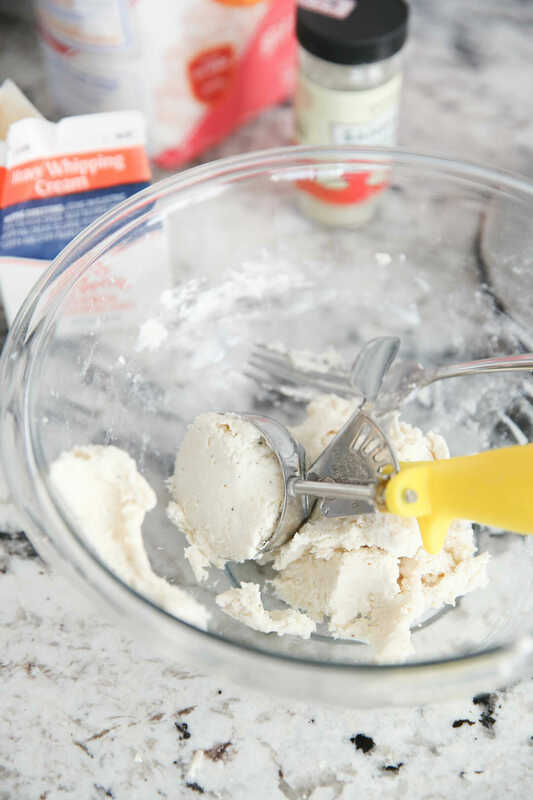 I love that because if you happen to have an extra little bit of cream leftover from another recipe or something, it doesn’t matter how much you have; you can make biscuits using that exact amount. You can make as little as 1 biscuit if you really wanted to! You can leave them plain or the add-ins are endless. I’ve made these both sweet and savory and they win every time. They literally take about 60 seconds to whip up! You’ll want to add a little salt, and that’s your basic dough. It should come together and form a cohesive dough. Now, let’s back up a step. If you want to flavor these bad boys, just toss in your desired seasonings with the flour, or simply before you mix it up. 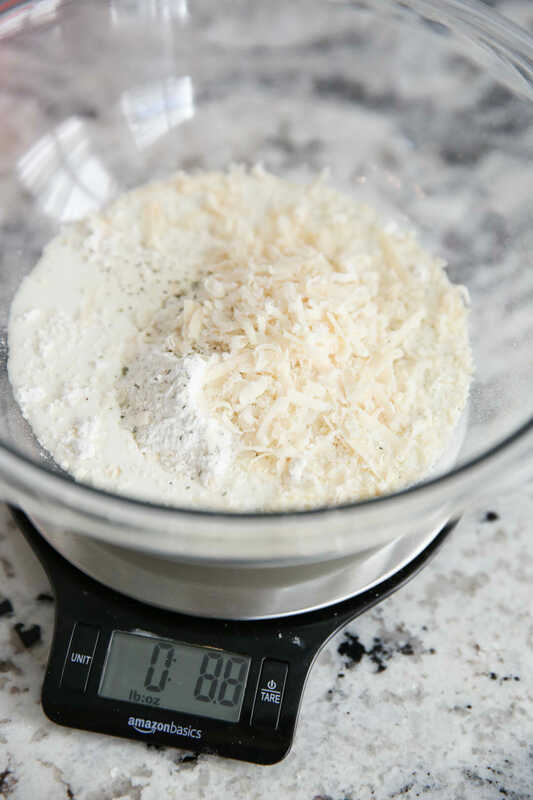 For this batch I added fresh grated Parmesan cheese, and one of my favorite seasoning blends. 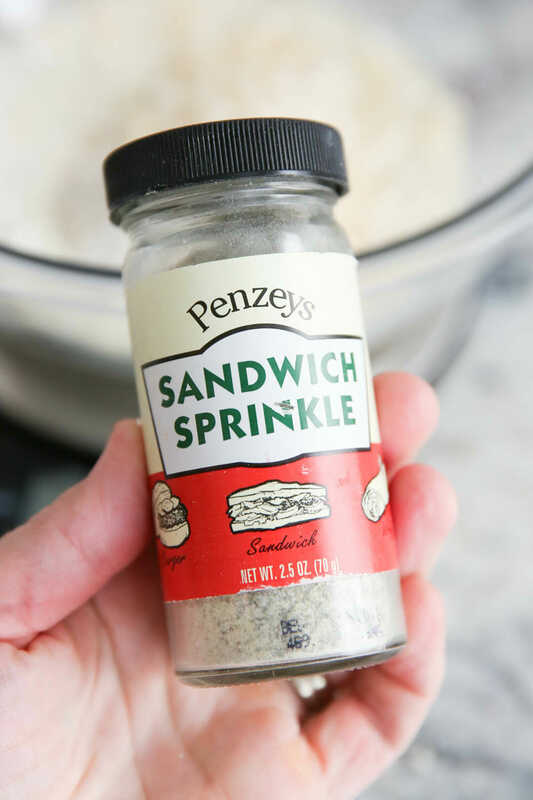 The seasoning is this Sandwich Sprinkle from Penzey’s. My friend Mel introduced it to me when we did this Facebook Live together and it has since become one of my go-to’s! Spoon them onto a baking sheet. I use a cookie scoop for uniform size, but you can just drop them on there if you want, or even roll them out and cut. And then brush with a little extra cream, milk, or water. The liquid on top actually helps them rise, so don’t skip that part. Bake them until puffed up and golden and then cool for just a few minutes before eating. These are so tender and rich, and fluffy soft inside. Try different flavor combinations, or go classic to eat with butter and jam. They’re also fantastic brushed with a little extra cream and sprinkled with sugar and used for berry shortcake. 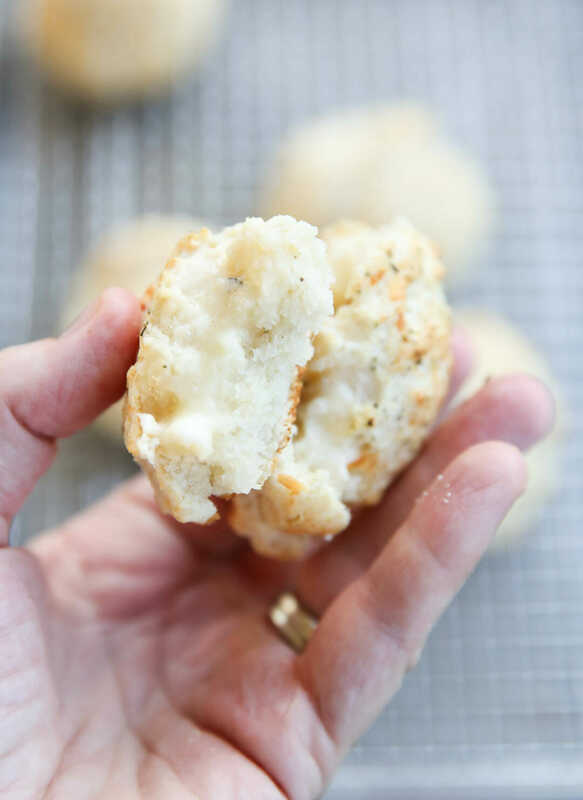 Put these in your biscuit repertoire and let me know if you come up with any winning flavor combos! 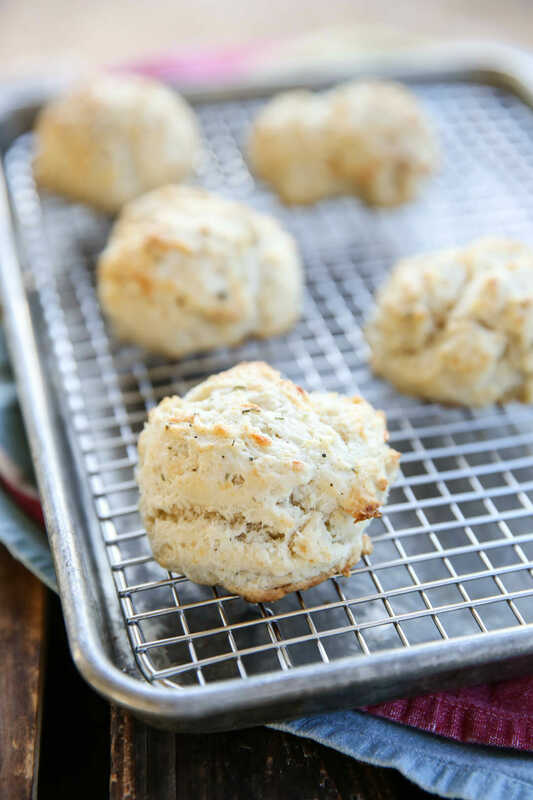 The simplest biscuit recipe, yielding pillowy-soft rounds perfect for customization! Takes just minutes to make. Preheat oven to 450 degrees. Line a baking sheet with parchment and set aside. Place all ingredients in a bowl and gently mix with a fork until combined. If dough doesn’t combine, very slowly drizzle in just a bit of extra cream until it comes together. 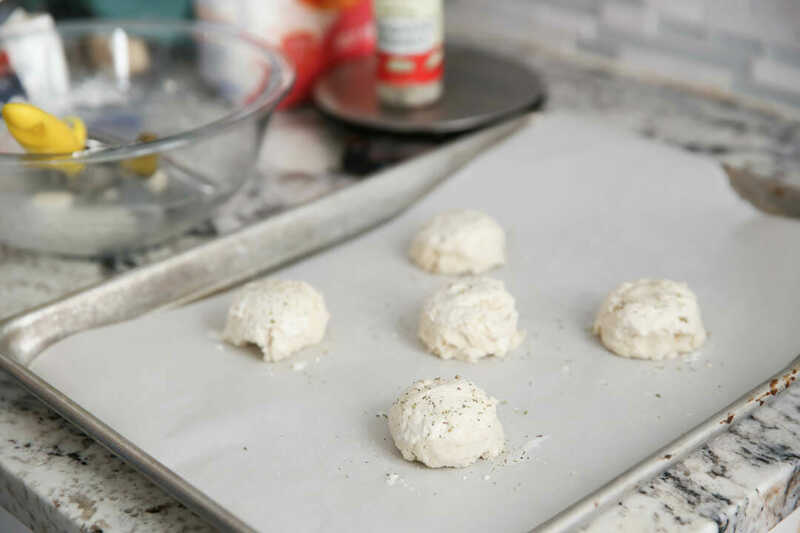 Spoon or use a cookie scoop to drop rounds onto baking sheet, 2-3 inches apart, or alternately you can pat/roll the dough out and then use a biscuit cutter. Brush the tops of biscuits lightly with cream, milk, or water. Bake for about 10 minutes or until puffed and golden. Yields 8-12 biscuits depending on size. Add different seasonings, cheeses, etc. for different flavor combinations. Simply mix in before combining dough together. Remember to decrease salt in recipe if adding a salty ingredient. These make great strawberry shortcakes as well! Speeeaking of Biscuits slathered in butter…have you joined our DietBet yet?? Click here for more info. It just barely started! Am I the first to comment? Hooray! These look delicious. I want to try it right now. Is midnight too late/early to try these? Thanks for all your wonderful recipes! These look so good! It’s crazy to think there’s only two things in here! These are delicious with grated lemon rind & dried cherries. Pat them into a round and cut into wedges. Also, a great savory is gorgonzola, chopped hazelnuts & dried cranberries. Really, just about anything can be added in. I wonder if the liquid used could be buttermilk…the reason I ask is that I never have cream leftover, but I do have a can of dried buttermilk (I could even add less water to make it thicker). 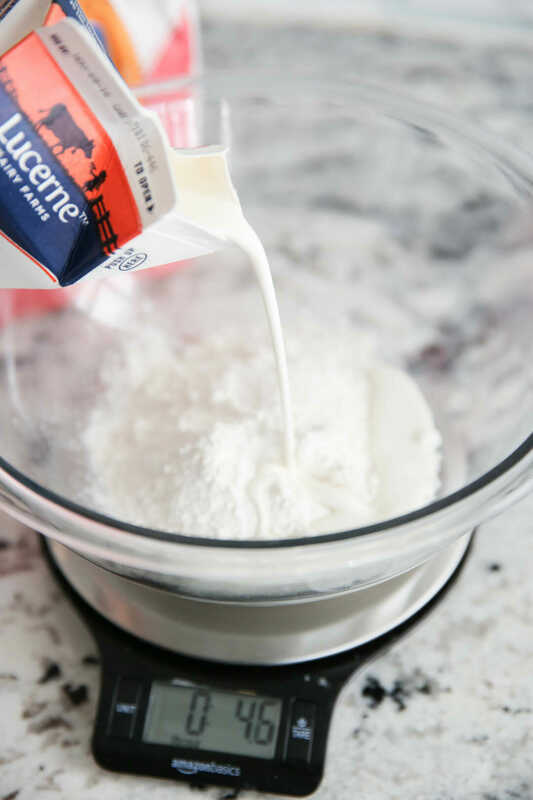 Of course, it might be a problem with the acid buttermilk and the leavening, but I would love to know if this was a possibility, especially because buttermilk gives biscuits such a nice tang. What do you think? Yes, I thought about the fat content after posting. Maybe sour cream, then? I should probably just try it and let you know! Thanks for the advice, I I said above, when we have cream we use it up for sure! No, sour cream won’t have nearly as much. Heavy cream is basically liquid butter, lol. I’d stick with that! Made these tonight and the whole family loved them! I’m so impressed by how easy and fail proof they were to make. We added 1/4tsp dill, 1/8 lawrys seasoned salt, 1/8 salt, 1/2tsp johnnys garlic bread seasoning. I’m happy to find a new use for the extra cream that usually ends up down the drain. These were awesome! The best biscuits I have ever made! Sooo easy!